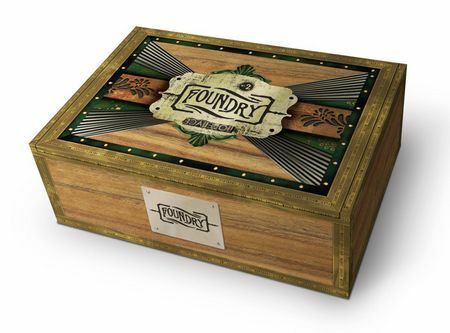 General Cigar introduced FOUNDRY, a new boutique collection, around August of last year. The line is a stark juxtaposition between the old and the new. This visually-arresting collection was inspired by the art form of “steampunk,” which is both a retrospective and futuristic interpretation of innovation. Below is a review of their 6 1/4″ x 54, the Lovelace. I’ve seen these for a few weeks now in my local B&M and had been reluctant to buy one because the whole gear thing seemed a bit gimmicky, and I’ve heard about construction issues. I’ve also heard quite a few positive things as well, and since they are a limited release I went ahead and picked one up this week. This seemed like a pretty mild smoke to me, nothing overpowering at all about this stick, smoke time was approximately one and a half hours. 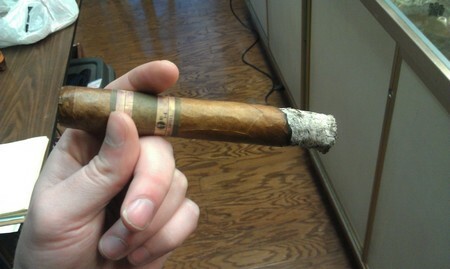 The burn was pretty decent to start, and throughout the whole smoke it has primarily earthy woody flavors. I picked up a hint of fruit during the second third, but it was very short lived. As for the construction of the cigar, well, I am afraid to say it was just as others have reported. The wrapper is very thin and starts to flake off in some parts, and I got a pretty decent crack at about the second third that was roughly an inch long. It didn’t go deep enough that smoke escaped from it, but it was a little unsettling none the less, and once the burn got to that point I had to touch it up a bit. The draw was a little hard on it, but nothing that made it too difficult to smoke. All in all I’m glad I picked this one up, if nothing else just to say I tried one, and to save the gear for whatever comes next… but I probably won’t pick up another one. I think I paid ~$7.00 US for it, so you could easily get another decent stick for nearly the same price. If you’re curious about trying one go for it, it was by no means a bad stick, but one is probably all you really need.